It's not every day! Mrs. Eula Matthews recently embarked upon her second century. 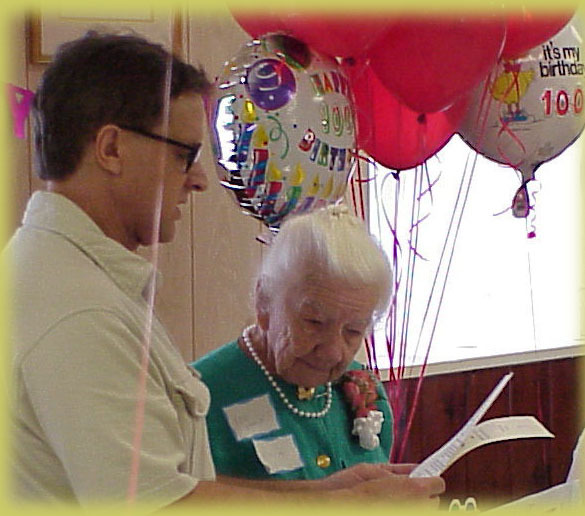 Gathering June 24 in celebration of her one-hundredth birthday at Grace Methodist Church were many friends and neighbors. Also marking this milestone were proclamations in her honor issued by Governor Rick Perry and by Austin Mayor Kirk Watson. This photo and others are courtesy of and available from René Barrera. An old prediction: can you date it? Too much government stands in the way of downtown redevelopment and expansion, says a downtown business group that envisions a business district extending south to Oltorf Street where older residential neighborhoods now are. Downtown Austin Unlimited, a 22-year-old organization, says that Austinites have to accept that downtown is going to grow in size, height and density, and plan for it now. Redevelopment suffers from city rules that protect older, single-family neighborhoods, restrict building heights and discourage high density housing, the group says in a position paper. In addition to removing the restrictions, Downtown Austin Unlimited wants central business district boundaries to be redefined now and reviewed every two years. "We're not suggesting that anyone's home be taken from them or their zoning be changed," Warran Beaman, executive director of Downtown Austin Unlimited, said Wednesday, "but downtown has got to expand somewhere." Beaman said he has lost three homes to growth-one displaced by the interstate, another by the airport and another by the LBJ Library-but has no ill-feeling because "those are things that are going to happen." By the turn of the century, the group predicts, the central business district will go south to Oltorf Street and in some places, east to Interstate 35 and west to Lamar Boulevard. The central business district includes land south of the Capitol, east of Lamar and west of Interstate 35. The southern boundary crosses Town Lake and is jagged. Beaman says the land has been "gerrymanded" [sic] as land is developed instead of being set ahead of development. Downtown Austin Unlimited wants the southern limit to be set at Riverside Drive and Barton Springs Road between I-35 and Lamar. The suggested review would allow the Planning Commission to extend the boundary up to 1,000 feet every two years. There are only two directions that downtown can grow, and only one of them is suitable, the group says. The city can't grow north or east because the land is owned by the state, the University of Texas or by the city for urban renewal. "From the west, we're fairly well locked in because no one in his right mind would want to change the use on West Avenue and all those beautiful houses," Beaman said. That leaves the south as the direction for growth. Travis Heights and downtown neighborhoods along East and West Bouldin creeks will be within the boundaries of what Downtown Austin Unlimited expects to be the business district by 2000. Of Travis Heights, Beaman said, "It is only a matter of time before a number of blocks in that area become CBD (central business district); there's just no other place for downtown to go." The central business district must be allowed to expand upward, Beaman said. High-rise housing with more density would save gasoline and be a healthy addition to the city's property tax base, the group says. The group's directors include bankers, developers, business owners, a realtor, a downtown resident and American Statesman business manager Harold Cline. Dorothy Rowland, vice president of Texas Commerce Bank, is chairman of the board. J. Burton Casey, of Watson-Casey Companies, is vice chairman. David Davenport, vice president of Austin National Bank, is treasurer. Beaman, the executive director, owns a public relations and advertising agency.